Supporting independent bands, musicians and labels with quality and style. We make merch you and your fans will love to wear. ToneThreads t-shirts are fitted styles, made from soft, comfy, high-quality, ring-spun cotton. Hoodies are durable, soft cotton-poly blend pullover hooded sweatshirts with drawstrings and a front pocket. We never skimp on quality. Artwork is printed using state-of-the-art printers with eco-friendly water-based inks that won't fade in the wash. We can print millions of vibrant colors in fantastic detail. Fans can be confident in knowing they are getting high-quality merchandise and are supporting their favorite artist with their purchase as well. When a fan buys your merch, we will print and ship it directly to them. No need to buy your merch in bulk or deal with inventory and shipping. ToneThreads is totally hassle-free and totally risk-free. You always get paid by your fans first. Simply design your merch on ToneThreads, add it to Bandcamp, connect your accounts and get back to doing what you love; making music! Merch made simple. Upload your artwork, click a button and voilà! Your very own merch store with your own ToneThreads URL. Not a musician or don't have a Bandcamp account? Sell on ToneThreads! You'll be amazed at how simple it is to set up your own shop. Upload any of our customizable mock-up graphics of your merch to your website or blog and embed your ToneThreads shopping cart and you've got your own shop that matches your website's design! Buy your merch at great print-to-order prices or bulk prices to sell at your shows, wear yourself or give away as promotional items and gifts. 10 different mockup graphics are generated for every merch item you create. Change the background color of your mockups to match your Bandcamp page or website. Use these on Bandcamp, Facebook, Twitter or anywhere else you want to sell or promote your merch. Base prices start at $9 USD per t-shirt and $16 per hoodie. For this quality of merch, you won't find a better price! Merch is printed and shipped from either the US, the UK or Canada, depending on your location, giving you great shipping prices and turnaround times. The time from when an order is placed until it arrives on your doorstep is often one week or less. Packages come from the you, the artist! The name on the return label will be 'My Awesome Band Name' ('My Awesome Band Name c/o ToneThreads' for basic accounts). Choose to shop in USD, CAD, GBP or EUR when shopping on ToneThreads artist shops. Upload any image and create highly original, customized artwork using our hi-res graphic design tools. You can even generate a fully customizable, print-ready waveform graphic from an audio file! Release your latest single along with its very own t-shirt! Our design tools were created with merch in mind, but you can also create promo material, cool graphics for album covers and anything else you like! 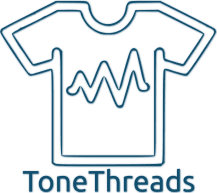 ToneThreads is the one-stop solution for musicians to design and sell high-quality custom band t-shirts and hoodies directly to their fans on multiple platforms including Bandcamp and their own ToneThreads shop, all without any upfront costs or dealing with inventory and shipping. Simply upload your artwork, we'll do the rest.